Buy Cheap 2.5 Inch Black 4.5mm Barrel Steel Ball |ReplicaAirguns.ca | New Website! http://www.ReplicaAirguns.com - KWC 357 2.5 Inch CO2 Airsoft Revolver Table Top Review. This is a table top only review of the KWC 357 2.5 Inch Black CO2 Airsoft Revolver. I talk specifications, show you around this BB revolver and walk you through its basic operation and handling. The KWC 357 2.5 Inch CO2 Airsoft Revolver is yet another addition to the increasing lineup of shell loading revolvers available today in both Steel BB and Airsoft versions. The 2.5 inch reviewed here is meant to be the compact version with its snub nosed barrel but I would have to say it is not a small gun at all coming in at 2 pounds and with rather large grips and a pretty large cylinder to pack around. But then again, that may be just what you are looking for? The shorter barrel will lower the fps a bit which may bring it back in line with the requirements of some Airsoft fields and the addition of the built in preset Hop-up, this pistol should shoot pretty well out at medium and even longer ranges. http://www.ReplicaAirguns.com - KWC 357 6 Inch Chrome CO2 BB Revolver Table Top Review. 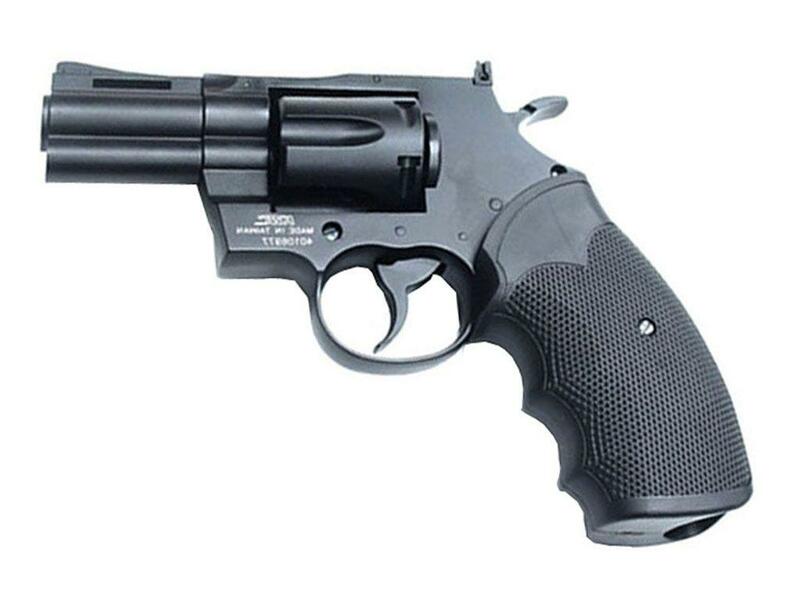 This is a table top only review of the KWC 357 6 Inch Chrome CO2 BB Revolver. I talk specifications, show you around this BB revolver and walk you through its basic operation and handling. The KWC 357 6 Inch CO2 BB Revolver like the Umarex Colt Python 357 has taken it up a notch in comparison to the Dan Wesson line by adding just a bit more overall weight, a smother trigger and hammer mechanism and styling this revolver on the Classic 357 magnum platform. And all of this for even less than the cost of the original Dan Wesson shell loading series CO2 BB revolvers. If you're a revolver fan, make sure to grab one of these, the Chrome finish is really eye catching and would make a great addition to your revolver collection for sure.